Anushka talks about her weight gain! 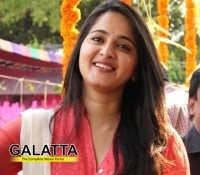 The promotions of upcoming romantic comedy Inji Iduppazhagi is on in full swing and the gorgeous Anushka who plays the lead role, has awed fans with her plumped up look. The actress who recently attended an event took the mic to share a few words about that look in the film. The actress who gained almost 20 kgs for the film said that she had no special diet to become plump. She stopped her workouts and had rice three times a day, to make her face and arms chubby. However, currently the actress has lost 6kgs as she has various other projects on her kitty. From September, the actress will rejoin the Baahubali team for work on the sequel that is to be released in 2016. Coming back to Inji Iduppazhagi... The movie stars Arya, Anushka Shetty, Sonal Chauhan, Prakash Raj and Urvashi, and is directed by Prakash Kovelamudi. Produced by PVP Cinemas, the film is expected to hit big screens on October 2nd.